In 1990, I was a senior in high school, living in Evansville with my grandparents. The calendar had just turned to December, and the local news was saturated with the name Iben Browning, a man who claimed to have predicted the 1989 earthquake in California (remembered by me as the World Series earthquake). He also professed to be a climatologist, scientist, inventor, and holder of a doctorate in physiology. He had predicted that conditions were right for a major earthquake to occur along the New Madrid fault line on December 3rd, 1990, a fault line that Evansville lies along. I remember a lot of people being really freaked out (me being one of them), many of them planning to stay home from work or school that day. There was no way I was going to go school and end up in a pile of rubble, but convincing my grandparents that I should stay home was another story. I finally get out of attending when I explained that since so many students were going to be absent, we probably wouldn’t be doing any work anyway. Luckily, my claim of the probable high absenteeism was corroborated by a local news broadcast the evening before E-day. It’s important to note that it was my grandmother that I won over, and she was the one who took care of getting my grandfather to allow me to stay home – my grandpa was much too practical to believe in such nonsense or ever take part in such hysteria. My brother David lived on the other side of town with a family friend (he was a freshman at another high school), but he wasn’t going to go to school either. So, he came over and the earthquake party was on! We brought a full-sized mattress into the living room and camped out in front of the television, anxiously watching the news and waiting for the world to shake. The plan was that once it started, we would get underneath the mattress, a place that would surely protect us from the house caving in on top of us (genius, I know). The night came and went without incident of course, as did the next day – December 3rd, Earthquake Day. My grandpa didn’t let us off the hook that easily, however. Our day off from school was filled with chores and yard work. I believe it was my grandfather’s way of telling us “I told you so” without saying anything. It was later learned that Mr. Browning was not a geologist nor a seismologist, he had no formal training in climatology, his doctorate was in zoology not physiology, he had not predicted the World Series earthquake, and his projection had been based on a widely discredited theory. Oh well, thanks for the day off, Iben! Getting back to present day; CNN was reporting that there was virtually no damage, and no reports of any casualties. 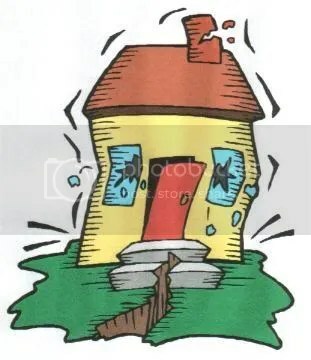 Once I had heard from my family that everyone was OK, I did some more online reading about the earthquake on the website of Evansville’s local newspaper, The Evansville Courier. At the bottom of any of their online articles, readers can leave comments for the world to see. There were over three hundred comments discussing the initial earthquake article, and I found several of them to be pretty amusing. Assuming that most people in the world don’t read articles on the Evansville Courier website, I thought I would share some of the comments that gave me a good laugh. Enjoy! That is honestly some of the funniest stuff I’ve read all day. That’s why I had to share! Ah, my hometown. I check that site sometimes and long ago realized that it seems to be a certain, strange segment of society that posts on there. (That’s why I signed up to be able to leave comments as well). Iben Browning…I had forgotten about that guy. Wonder if he’s related to Iben Tooten. I traced their heritage – they’re both distant cousins of Iben A. Jirk. Here, it’s hurricanes, traffic, and an 11-month summer. There, it’s tornadoes and the occasional trembler. The tipping points for me are family, the house (buying the family house), change of seasons, and the absence of palm trees. So, yes, I do. I want to move to Evansville based solely on the comments. Those people know how to laugh at life. And if they were not joking, I want to move there anyway so that I can have plently of people to snicker at. I’d say it’s half and half, which is perfect. I loooove Evansville! I dont venture up there as often as I used to, but there’s usually at least one trip a month made. Yeah, that’s the “big city” to us little Kentucky townfolk. I’ve been away much too long to be allowed to make any Kentuckian jokes. Big city, here I come! Now that’s some good stuff.